This morning we had a little scare. It was not a big deal, but in my pregnant hormonal state it took all I had to remain calm (at least until we were in the clear, and then the water works came haha). We’re traveling today and in our hurry to get out the door my toddler locked us out of my parents’ house, which is not exactly baby proofed (read: dangers at every corner 😬, a cat that doesn’t like my kid, space heaters on, and not-so-kid-friendly ongoing home improvement projects, sorry for outing you, parents! ). All our spare keys were locked inside the house with the toddler and for a second the only thought that crossed my mind was to try to wiggle myself in through the doggie door (mind you I’m 8 months pregnant…). My dad and I ran around the house to five different doors to find them all locked, with a few choice words being said on my part, oops! While this was happening, and shortly afterwards, I used the following strategies to help me calm down since I knew that that my potty-mouthed version wouldn’t get anything accomplished; hopefully they can help you too in a moment of panic! 1. Act as normal as possible: I know it’s pretty hard to keep going about your day and act as your usual calm self does when the situation around you calls for screaming and anxiety, but hear me out on this one. Panic can snowball out of control if you let it dictate how you act. 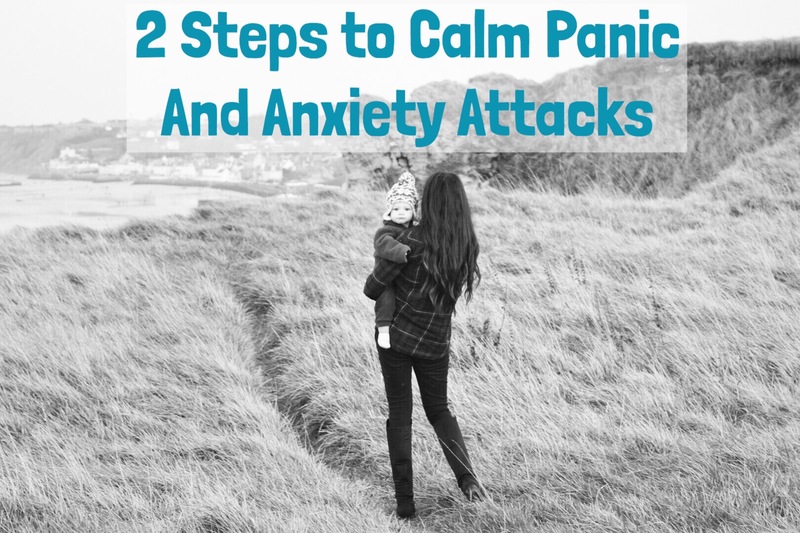 If instead, you try to act calm, the panic can be ‘tricked’ to leave you to continue acting normal. This morning while I was pounding on a door, I made a specific mental note to not freak out and act as I would normally in order to think through the situation and figure out the best course of action. I know that if I’d panicked I would have been running around the house jamming my pregnant body into every door available trying to break it down – not helpful. 2. Use your brain: because the fight or flight response becomes activated during moments of panic, our bodies take over and our brain power decreases. By making a conscious effort to think through something, especially something that requires you to focus a bit, it forces your brain to come back ‘online’ and the panic to decrease until the anxiety leaves. This morning I forced my brain to act methodically by dialing my sister’s phone number, explaining what had happened (trying to choke back tears haha), and then telling her to not to the same thing when she visits their house. Another use of your brain could be doing a sudoku puzzle, counting backwards from 100 in multiples of three (very helpful! ), or naming colors of things around you that start with a certain letter (I’ve used this strategy before and it works wonders). My dad eventually managed to open a door and all in all my toddler was alone for about a minute. As I mentioned, once I saw my kiddo the pregnancy-hormone-fueled tears started flowing so I had to employ strategy #2. And once I was more calm I utilized deep breathing (more info here) to return to a resting heart rate. Isn’t it funny how quickly things can be blown out of proportion (especially when you’re pregnant 🙋🏻)? I hope these tips are useful for you when you need them (bun in the oven or not). My little family and I will be in NYC this weekend partaking of all that is the magic of Christmas in my favorite city, follow along on insta for more snippets of our weekend 👍🏼.